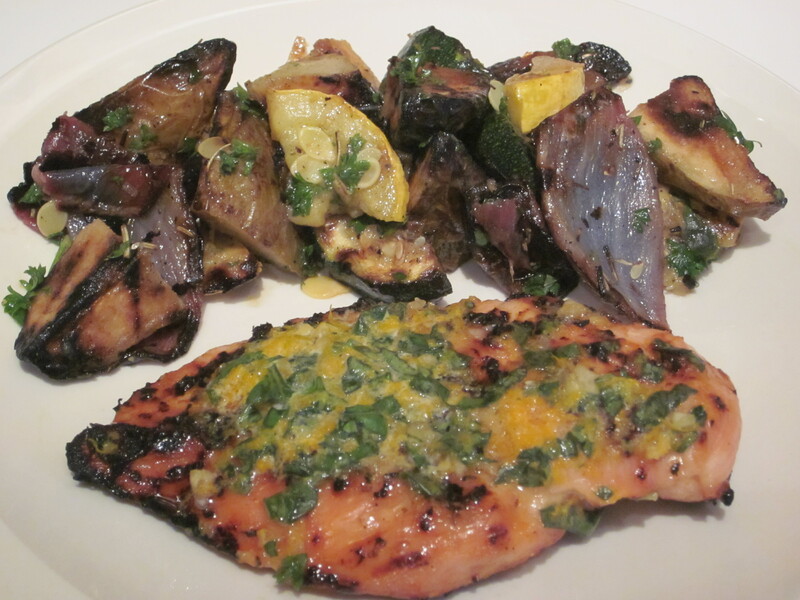 Grilled Chicken and Orange-Herb Butter With Grilled Veggie Potato Salad | This Girl’s Gotta Eat! This rustic meal is fairly easy thanks to the grill. And the compound butter used for the chicken is a great trick for infusing flavor, while keeping the meat juicy. You can switch out the citrus and herbs in the butter for what you have on hand, I did! Preheat grill to medium-high. Drizzle chicken with olive oil and season with salt and pepper. Grill covered, about 4 minutes per side or until the juices run clear. Boil sliced potatoes for 5 minutes. Drain well and toss with olive oil and rosemary (I used dried). Grill the potatoes, 1/2 lemon, sliced red onion, sliced zucchini and sliced squash until you get good grill marks on both sides. Remove from grill and when cool enough to handle, chop the potatoes, onion, zucchini and squash. Toss everything with olive oil, parsley, salt and juice from the grilled lemon. To make the orange-herb butter: Mash together unsalted butter, orange zest and juice, cayenne pepper, garlic, basil and coarse salt. Set aside until the chicken is done. Once the chicken is done, remove from grill and top with orange-herb butter, cover with foil and let rest 5 minutes. Serve chicken with the veggie potato salad.